CHICAGO, IL--(Marketwired - February 18, 2016) - Advanced Resources, a leading Chicagoland staffing firm and talent solutions provider, announced today they have earned Inavero's Best of Staffing® Client and Talent Diamond Awards after winning the Best of Staffing Client and Talent Awards at least five years in a row for providing superior service to their clients and job seekers. Presented in partnership with CareerBuilder, Inavero's Best of Staffing winners have proven to be industry leaders in service quality based completely on the ratings given to them by their clients and the permanent and temporary employees they've helped find jobs. On average, clients of winning agencies are nearly three times more likely to be completely satisfied and talent are 45% more likely to be satisfied with the services provided compared to those working with non-winning agencies. Focused on helping to connect the right people with the right positions, Advanced Resources received satisfaction scores of 9 or 10 out of 10 from 70.6% percent of their clients and 72.8% percent of their talent, significantly higher than the industry's average (27% and 49%, respectively). With fewer than 2% of all staffing agencies in U.S. and Canada earning the Best of Staffing Award, just 22% of the 2016 Best of Staffing winners earned the Diamond Award distinction. "We are honored to be named a Best of Staffing company again this year," said Advanced Resource's President Rich Diaz. "We strive to create an experience unlike any other staffing firm. Many companies claim to provide great service, but few can prove it. Being named to this list for the seventh consecutive year demonstrates our ongoing commitment to excellence." Inavero administers more staffing agency client and talent satisfaction surveys than any other firm in the world. Inavero's team reports on over 1.2 million satisfaction surveys from staffing agency clients and talent each year, and the company serves as the American Staffing Association's exclusive service quality partner. 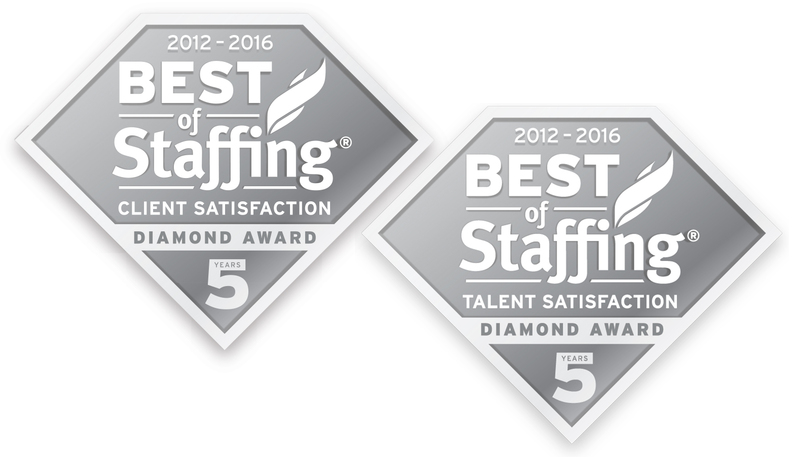 Award winners are showcased by city and area of expertise on BestofStaffing.com -- an online resource for hiring professionals and job seekers to find the best staffing agencies to call when they are in need. Advanced Resources provides temporary staffing, direct hire placement, and workforce business solutions for Human Resources, Technology, Healthcare, Finance/Accounting, and Office Support talent. Founded in 1988, the company is an established leader in the staffing and human resources fields, assisting clients and associates in a wide variety of industries through their four branch locations in Chicago, Downers Grove, Northbrook, and Schaumburg. Advanced Resources is Chicagoland's top award-winning staffing firm: Best of Staffing®, Chicago Tribune's Top Workplaces, Best Places to Work in Illinois, Best and Brightest Companies to Work For® (Chicago and National).